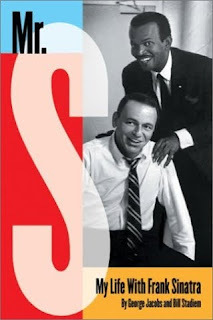 In an attempt to help get in the right mood for Mad Men's third season return to TV, I decided to start reading Mr. S, a book about Frank Sinatra by his former assistant, George Jacobs. Sure enough, this much thinking about Ol' Blue Eyes had me thinking about cocktails in the afternoon (which I could, technically, enjoy, since I just began a 10-week sabbatical) and all the other romanticized/stupid notions of an era gone by. Mr. S begins in Summer 1968, when Sinatra's disintegrated marriage to the much-younger actress (and later to be married to Woody Allen) Mia Farrow gets ugly at their Bel Air estate north of Sunset Boulevard. He is disgusted by Farrow and her generation's "permissive youth culture [that is] a threat to the American Way." They eventually live separately in the house and refuse to speak to each other. Jacobs, who obviously experienced some very behind-the-scenes moments with Sinatra, notes that "the weirdest part [about this time period] was that there was no music. Mr. S didn't play his jazz, didn't play his Puccini, and Mia didn't play her Beatles or her Moody Blues. It was truly the sounds of silence, and it was loud as hell." Sinatra "detested hippies, detested long hair, even had his screenwriters write in jibes about them in his films." He also hated the mods, the Beatles and Stones, and the swinging London Carnaby Street scene. He didn't care how good any of the new music was, he just viewed it as one big excuse for people to take drugs. Another sign of Sinatra's being from a different era than that of Farrow's, he always called his helper "George," although sometimes, especially in front of his gangster friends, he called him "Spook," which he claims didn't bother him. The best thing about being Sinatra's assistant was this: "Except for Mia, hip young chicks had no interest in meeting Frank Sinatra in those days. He was off the radar of coolness. [But] my working for him ... was what was cool. It was like working at the White House. It made folks want to meet you. It gave you a mystique." Another fun fact in the early pages of this book: Stylist Jay Sebring made house calls to cut the super-sensitive, balding Sinatra's hair. Sebring was soon to be murdered by Charles Manson's gang. I love this Mad Men-like stuff, and can't wait to get back to this book.